Writing can be of significant value when used in a conscientiously applied program of oral hygiene and regular professional care. By the tideless dolorous midland sea. Sometimes I turn, there’s someone there, other times it’s only me. Once upon a time–it seems like long ages ago–I taught in an independent school on the Upper East Side of Manhattan. My job was to introduce wealthy kids to the amazing world of science. It wasn’t a hard job. If you lit a candle, the 5th grade boys would “ooh and ahh”, so much so that I would tell them to get out more often and see a show once in a while. In the back of my classroom, in an oak cabinet with a glass door, I had a row of small bottles with black caps. Each container had a label. I think I had about twenty. The bottles were half the size of a typical test tube. This was my collection of sand. Yes, I collected sand. It makes more sense than a ball of string, rubber bands or empty beer cans from brewers that no longer exist. I had an advantage that most sand collectors would envy. Most of my students went to the warm places during the holiday vacations. Some went skiing in the Alps or Aspen, but it’s hard to collect snow. I would give my south-bound students a zip-lock bag and ask them to bring me some sand from wherever they went. I had black sand from Hawaii, pink sand from Bermuda–I had sand from the shores of the Dead Sea and sand from Ipanema Beach in Rio. Needless to say my sand collection was quite impressive–if you’re impressed by such things. I think sand is as beautiful and thought-provoking to look upon as a crystal of Rhodochrosite, Halite, Calcite, Serpentine and even Garnet. Notice I didn’t say Diamond. I do have some sense of value. Sand is the stuff of poets and philosophers. These poets and philosophers have a fair grasp of the sublime nature of sand, as a physical substance that you can hold, and as a metaphor for human existence. The ancient hour-glass is impossible to look at without thinking of the ticking of life’s clock. How many poets have reminded us of this? How many images are there of The Grim Reaper who carries a scythe and an hour-glass? The message is simple, when your final grain of sand had fallen through the narrow glass, the flow of time needs to stop for you. We saw the small sign indicating a beach. Turning right off the main road, we arrived at a tiny parking lot. Even with sunglasses, the sun reflected from the white sand with a glaring intensity, it made you squint, it made your eyes water and it made you want to run naked along the narrow beach while singing an aria from Puccini. That probably would have resulted in an arrest and a fine that I had no wish to pay. Some say that if you see one beach, you see them all. There is some truth in that. The elements of sand, or pebbles, or shells, the washing of the waves, the palm trees, the pine trees, or the coconut trees are present along many beaches. Some, like those in Maine, add a rocky aspect to the mix. 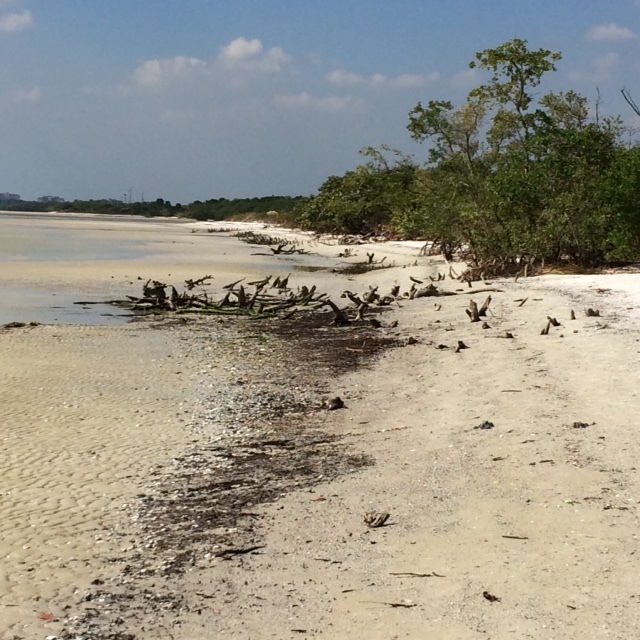 But the beach I stood on just outside Fort Myers, in Florida, was almost pure white. It made me blink. It made me reach for my tube of SPF 45. The sun’s intensity was turning my forearms brown as I stood and watched. This was the Florida I came to see. This was just one of the beaches I intended to visit. And, beaches never fail to set my mind to wandering and wondering and thinking, about life, death, endless motion and the ultimate victory of the sea over the land. Yes, sand is one of the most powerful metaphors for life and change. I’m hard pressed to think of any natural substance, so common, so varied and so beautiful that speaks to so many souls and poets and painters, about the transitory life we lead. Every grain of sand, whether its common quartz, feldspar, weathered basalt or bits of sea shells, owns its own particular intricate shape and luster. It’s just like what’s been said of the individuality of snowflakes. But, snow is not on my mind these days. 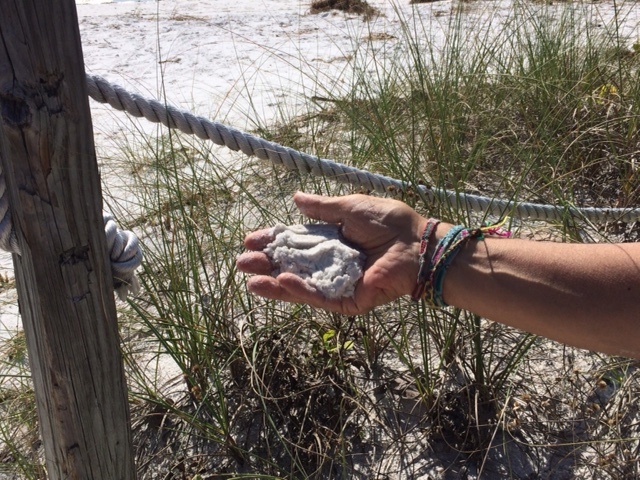 This entry was posted in Blogging, Nature, Objects of Beauty, Teaching, The sea, Time, Travels, Uncategorized and tagged Atlantic Ocean, beach, Fort Myers FL, Gulf of Mexico, minerals, sand. Nice – I like the photo of the Beach. Even though it’s hot wish I was there.